Artist Liliana Porter seems to delight in making mischief. 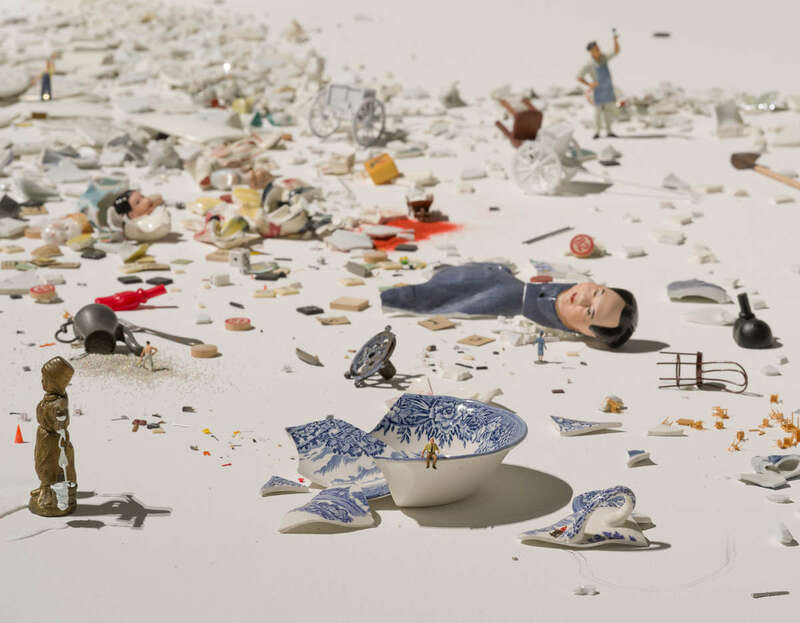 Since the 1960s, she has been creating absurd, funny, disorienting little scenarios with the anachronistic toys and trinkets she finds in flea markets and antique stores. Born in Buenos Aires, Argentina, in 1941, Porter has been based in New York for several decades. Her practice spans painting, printmaking, photography, sculpture, video, and theatre. “El hombre con el hacha y otras situaciones breves – Venecia 2017 (Man with an Axe and Other Brief Situations – Venice 2017),” currently on view at the Pérez Art Museum in Miami, is a sort of retrospective of the artist’s work, many themes and characters from her earlier pieces making reappearances: the toy penguin conversing with a bust from her 1999 photograph, “Dialogue with Penguin,” the myriad of workers doing tasks that seem superior to their possibilities, a lone figure with a suitcase. The piece, originally produced in 2014 and reinstalled for the 2017 Venice Biennale, was recently acquired by PAMM and adapted specifically for one of the museum’s galleries, where it will remain on view through September 29. “The man with the axe could be, among other possibilities, a metaphor for the passage of time,” Porter told me. Here, like in her earlier photographs and prints, Porter is deeply influenced by Magritte’s obsession with objects and how they are represented. “Man with the Axe” is, above all, a meditation on reality and memory, a rejection of the objectivity we tend to associate with time. 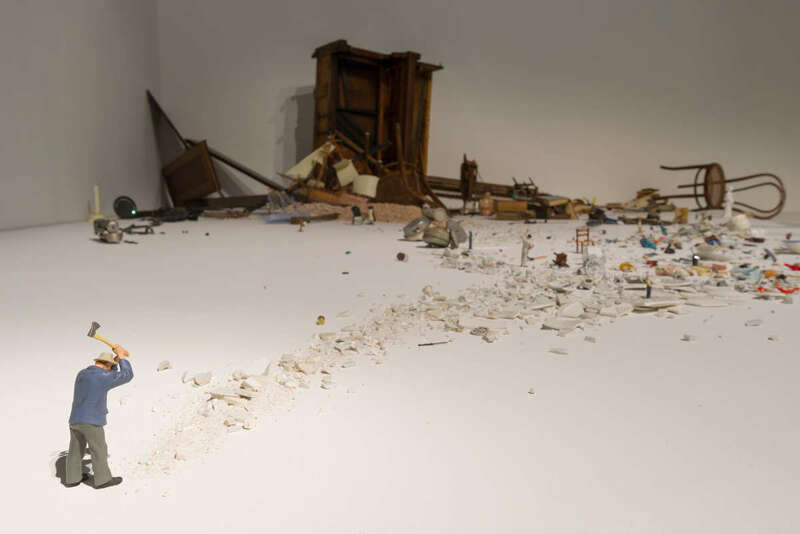 At the front of the installation, a tiny plastic figurine wielding an axe appears to have created a wide crack in the white floor. Behind it, a pile of objects of varying scales form tiny vignettes, brief situations: two toy soldiers aiming at a wooden block, a woman in a yellow bucket hat cleaning up an infinite streak of what appears to be blood. Some of these characters are nameless, like the woman in pink knitting a cloud-like mass five times her size. Others are more familiar: in Porter’s imaginary world, historical figures like the Kennedy’s and Napoleon coexist with fictitious ones like Alice in Wonderland and Mickey Mouse. Throughout Porter’s kaleidoscope of objects, broken clocks are a recurring motif that, like Salvador Dalí’s melting time-keepers, function as stand-ins for the fragility and unreliability of time. Through jarring tricks of scale and historical period, Porter rejects the linearity of time and its representation. Her wacky little beings beg for a different kind of storytelling, one where narrative precedes time. As in Porter’s previous work, humor is central to the installation. While the tiny characters are left unaltered by the artist, the situations they find themselves in are inevitable funny. “Humor is a tool that is able to ‘reformat’ distress,” Porter said. The artist’s wry creations use familiarity to contradict logic, and, like any good joke, capitalize on the element of surprise. Porter’s surreal representations of the body and the human condition have established her as a central figure in postwar Latin American conceptual art. In “El hombre con el hacha” the artist treats different scales, temporalities, and categories with absolute democracy. A lone figure in the piece carrying a suitcase has figured in some of the artist’s previous works. Porter has called him a time-traveler, but couldn’t the figure also be an immigrant, a refugee, someone looking for better opportunities? Especially in a city like Miami, one of the epicenters of immigration in the United States, “El hombre con el hacha” is a necessary reminder of the artificiality of constructs like nationality and legal status—a reminder that, just maybe, the democracy with which Porter treats her little figures could be implemented in real life. 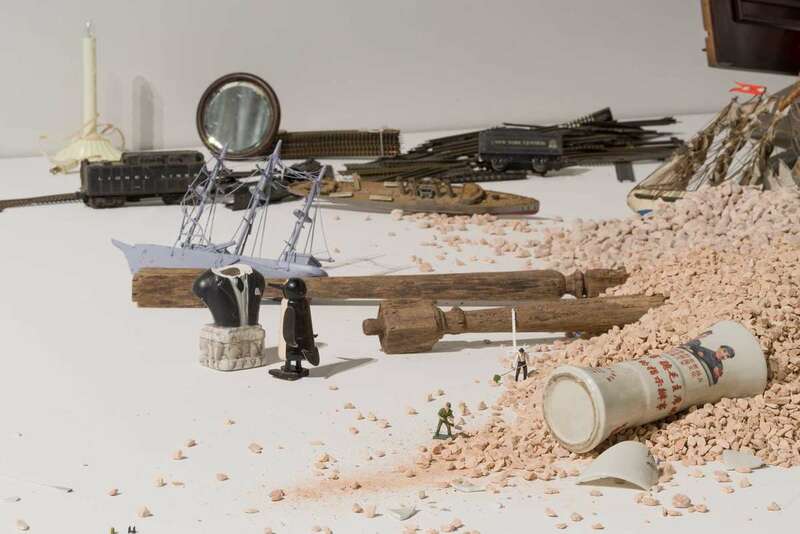 “El hombre con el hacha y otras situaciones breves – Venecia 2017 (Man with an Axe and Other Brief Situations – Venice 2017)” is on view at the Pérez Art Museum in Miami through September 29.
Credit: Liliana Porter, El hombre con el hacha y otras situaciones breves – Venecia 2017 (Man with an axe and other brief situations – Venice 2017), 2017. 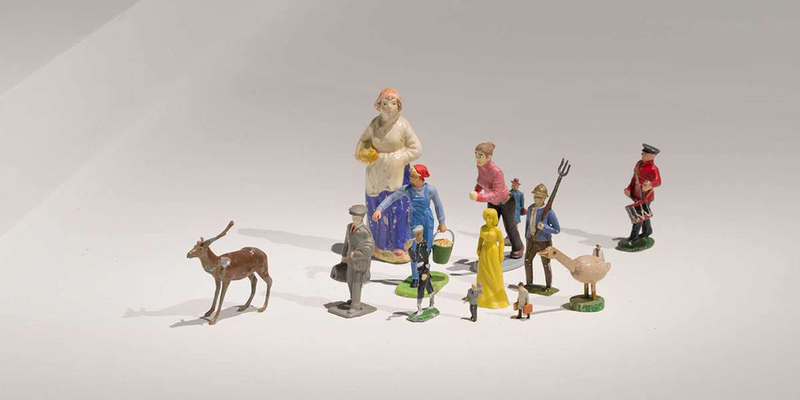 Figurines, objects, and wooden base. Collection Pérez Art Museum Miami, museum purchase with funds provided by Jorge M. Pérez. Images courtesy the artist.